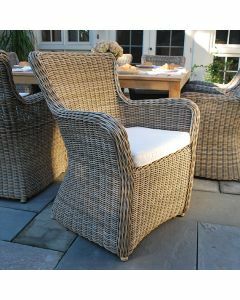 The Wainscott square dining tables work well with a variety of teak or woven dining chairs. The tables feature mitered corners and mortise and tenon joinery for a streamlined look. The 42" table seats four and accommodates Kingsley Bate Teak 9' Market Umbrella; the 61" table seats eight and accommodates Kingsley Bate Teak 10' Umbrella. Both tables ship knocked-down with easy assembly. Overall smaller table measures 42"W x 42"L x 29"H, and larger one measures 61''W x 61"L x 29"H. Select your size in the drop-down menu below. Click on images for greater detail. If you are interested in purchasing this item, please call us or email Customer Service for any additional information. *In the main image the 61" square dining table shown with Kingsley Bate Sag Harbor Dining Armchairs. Click HERE if you wish to buy the chairs.